Mary Somerville was an influential figure in nineteenth century science. However I must admit that, until I read Chapman's new book ,I knew very little about her (apart from the fact that Somerville college was named after her). This book isn't simply a biography of Mary Somerville, it is more about putting her into the context of the scientific world of the nineteenth century, and seeing why she isn't as well known as maybe she ought to be. It also looks at that peculiarly British phenomenon, the Grand Amateur in science. The book doesn't stick to the chronological sequence of events, which is something I think I would find off-putting if it were meant to be a simple biography, but as it is I think it works very well. Mary was born in 1780 and was an intelligent child, and an avid reader, but didn't get much of a chance to fulfil her potential until she married her second husband Dr William Somerville in 1812. This was the time of the Scottish enlightenment and he was happy that they should both play a part rather than being upset because she outshone him. It is here in the book that one appreciates Chapman's wide knowledge of the history of science as he introduces us to the famous scientists in the Somervilles' circle of acquaintances. In astronomy for instance there was John Herschel, son of the discoverer of Uranus. In this subject Mary's mathematical skills were much appreciated. Chapman also gives us a feel for what questions were being debated at the time, such as the nature of astronomical nebulae - were they condensations of the luminiferous ether? However, Mary's expertise covered a wide range of subjects. She published papers concerning her experiments in optics - more specifically the effects of different parts of the spectrum on various substances. Being a keen traveller, she also had an interest in geology. This got her involved in some of the thorny religious questions of the day - but more on that later. In 1831 Mary's first book Mechanism of the heavens was published. Mary was already well known in the scientific community, and the books sold well, further increasing her reputation. It is interesting to note that she was over 50 when her first book came out - quite a contrast to today's world where the pressure is to be successful at an early age. This work was followed three years later by On the connexion of the physical sciences . This was that rare occurrence, a book which could bring together knowledge from different subject areas, and one sees Mary's wide grasp of the sciences (and Chapman's for that matter). Her books seemed to fulfil a need, still present today to some degree, for books which are not textbooks or specialist books, but nor do they 'dumb down' the subject. In 1840 the Somervilles' lives changed when they moved to Italy following a decline in William's health and the need to live more cheaply. However, Chapman shows that this didn't cut Mary off from her position in the scientific community. The correspondence kept flowing, and in that age of increasing travel there were frequent visitors. Mary went on to write further books, Physical Geography, and (at the the age of 89) On molecular and microscopic science. A woman in a man's world? The final chapter of the book looks at how Mary's career was restricted by the nature of the society she lived in. She could not hope for a salaried position of the kind she would certainly have today, but Chapman points out the futility of 'What if?' As he says, being able to earn a living from sales of her books wasn't necessarily worse than receiving an income from a scientific institution. Maybe we might have a Somerville's Law if things had been different, in which case Mary Somerville might be better known today, but what she actually achieved can be considered to be just as important. In fact we are shown how she succeeded in following a narrow path in getting more participation of women in science. On the one hand there was the temptation to include more women in science by making it easier, rather than emphasising that women could reach the same level as men. On the other hand there was the possibility that she might have been more accepted into the scientific establishment, but as an 'honorary man', thus failing to advance the prospects for women. Chapman also looks at Mary's attitude to religion. This was the time when the literal truth of the bible began to be seriously questioned, and Mary played a full part in defending the new ideas. Chapman has written elsewhere questioning the simplistic notion that science and religion are natural enemies, and here he shows that Mary could maintain a firm religious belief despite disagreeing with what many churchmen were saying. Allan Chapman is much sought as a speaker, and this translates into readable book, although occasionally there is an over-long sentence which one feels needs the extra expressiveness of the spoken word. The book is short - the main body of the work is just 125 pages (there are 25 pages of notes at the end). One wonders why it isn't longer, especially as many authors have a problem keeping their work down to a reasonable length. On the other hand a compact book like this is well suited to many situations. 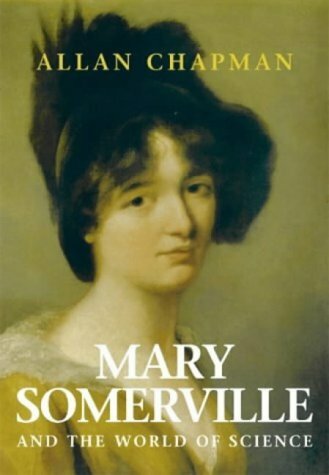 Until now there hasn't really been a biography of Mary Somerville aimed at the general reader. This book doesn't entirely fill that space, being equally concerned with describing the society she lived in, but it does serve to introduce her to a wider audience. It will also suit anyone who is interested in how scientific ideas developed in the nineteenth century, or the phenomenon of the 'Grand amateur'. If you want to find out more about these things then this book is a highly enjoyable place to start.